We just had breakfast this morning at this “Japanese style café”. My better half actually wanted to go have xiao long bao but I was craving for my morning cup of coffee and she conceded to go with my choice instead. 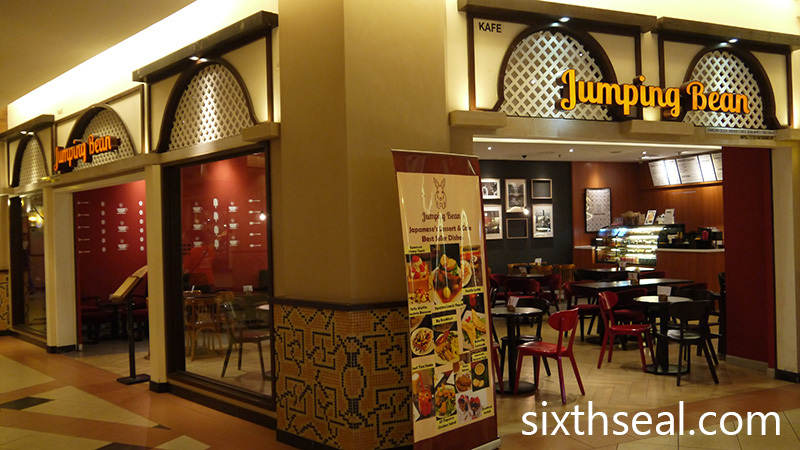 <3 Jumping Bean Café sounds like a good of a place as any to load up on caffeine and I needed it for our 8 hour Chinese New Year shopping marathon. 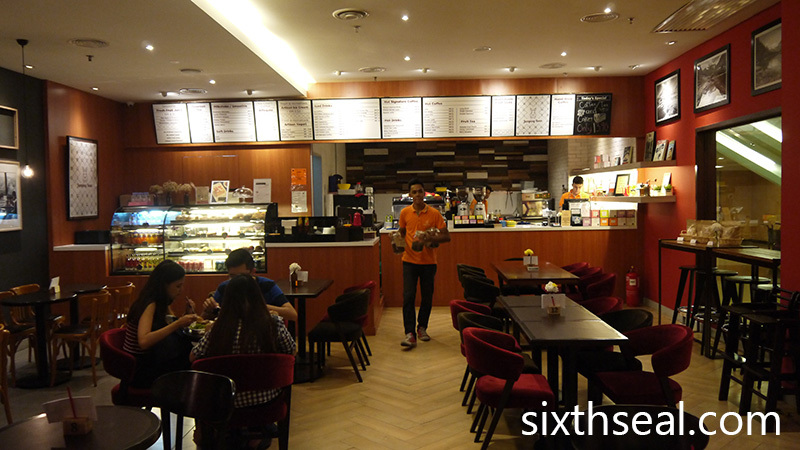 The café was quite deserted when we were there and I know this particular lot in Sunway Pyramid has gone through a lot of management and café/restaurant changes. I thought it might be wise to eat here before it closes down. This happens a lot with us, especially in the ultra-competitive Dataran Sunway area, a prime example would be Flaming Melt (shuttered up 3-4 months after opening). A place called Jumping Bean better had good coffee and I wasn’t disappointed. I asked about their Siphon selections and was presented with a Brazilian roast, Guatemala Antigua beans (suspect this is the same one that Starbucks offers) and coffee from Tanzania Kilimanjaro. I like how they actually take the trouble to bring you the coffee beans for choosing. I chose the final one and it was a good cup of coffee. 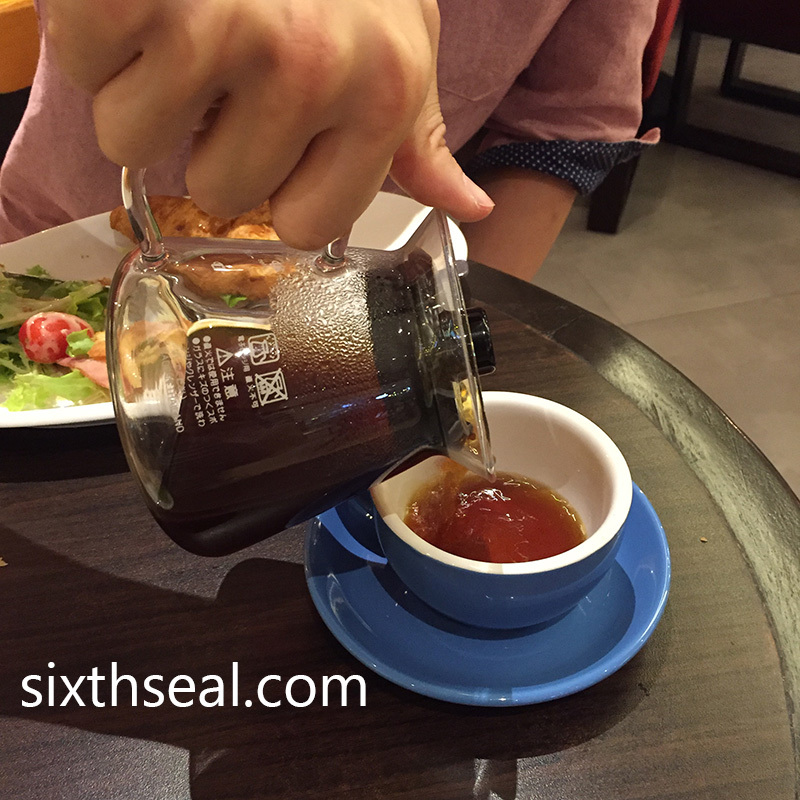 I would have preferred the Siphon coffee system to be done at my table but I understand the constrains of space would have prohibited that since we ordered quite a lot. My dear had this buttery croissant filled with turkey slices and cheese. It’s rather good, the croissant is home baked. 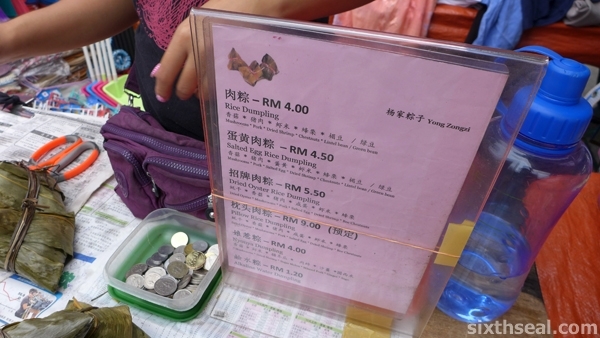 Also pictured is her order of Iced Royal Milk Tea (RM 12). The side salad is the same as mine, I believe they just make one large portion. Nothing special but the star of the dish shined. This was my order. It was described in the menu as the “best pair(ing) in the world” and I’m inclined to agree. 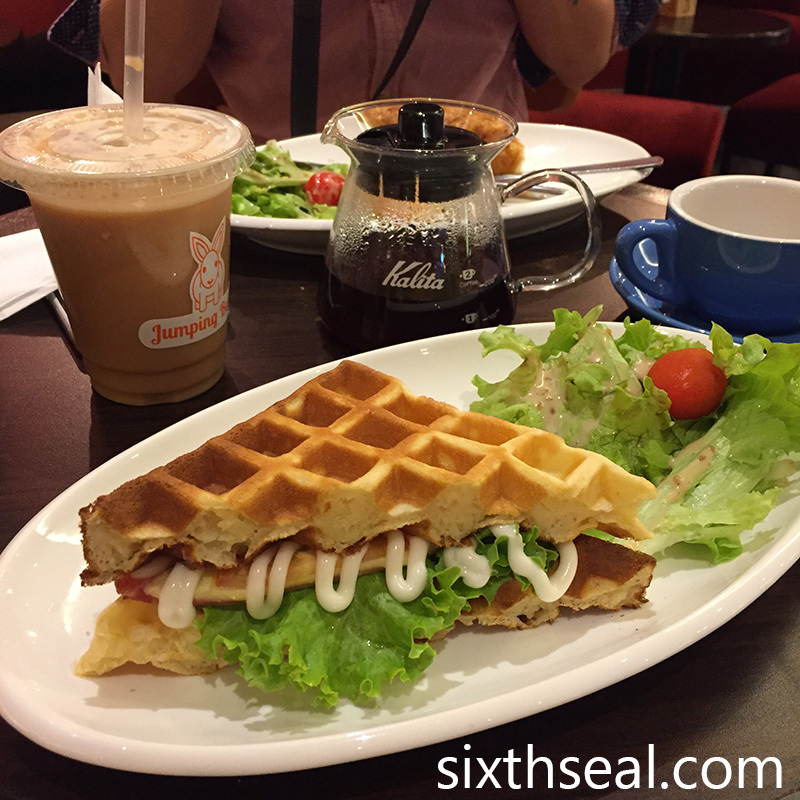 I do like sweet, fluffy waffles filled with savory items. Mine had turkey ham, cheese and egg. It was good, if a little small, portion wise. 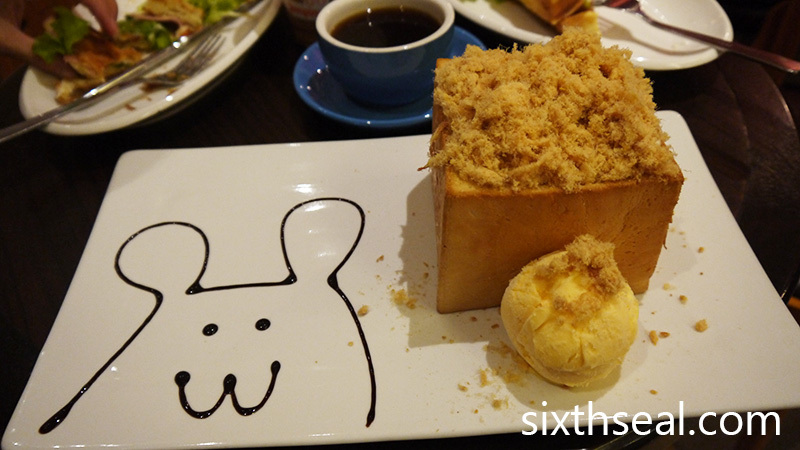 We were supposed to have the “Japanese inspired” Mix Fruit Honey Toast (RM 19.90) for dessert but I wanted to try the unique sweet-savory chicken floss honey toast instead. It’s one of those home baked square of bread deals, with the inside cut out and made into 3 x 2 slices of “toast soldiers”. They’re supposed to cut it even smaller, into a 3 x 3 x 3 matrix (from what I gather from the pictures) and I thought it was sloppy that they didn’t. 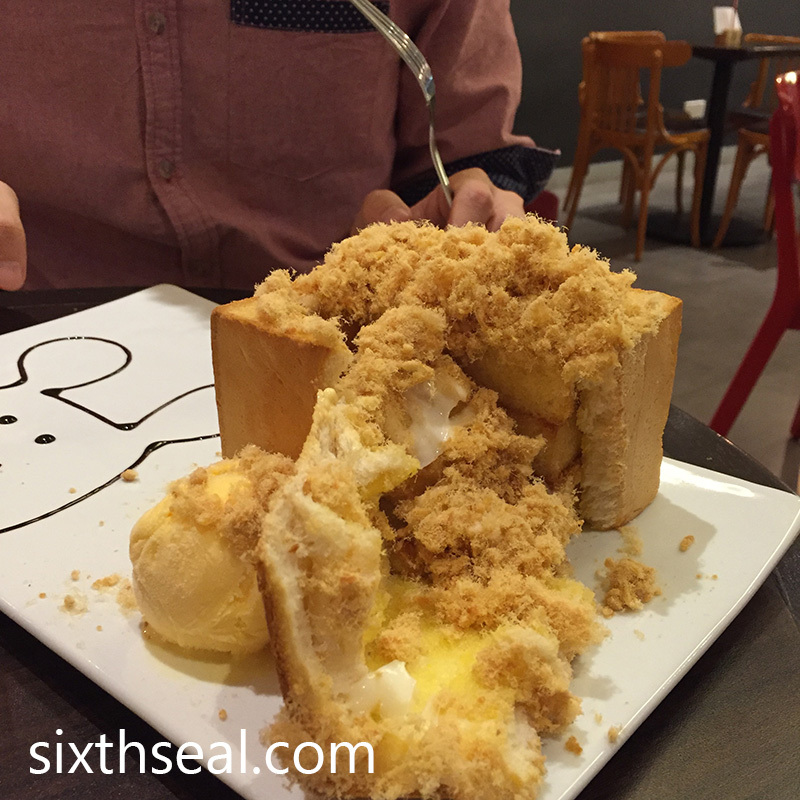 It didn’t taste as good as it could have, due to the thicker array of toast soldiers but I did like the honey and mayonnaise and chicken floss combination, especially with the creamy vanilla bean ice cream. The sweet and savory combination isn’t for everyone though – I ended up single-handedly finishing the huge dish – but it tasted nice to me. 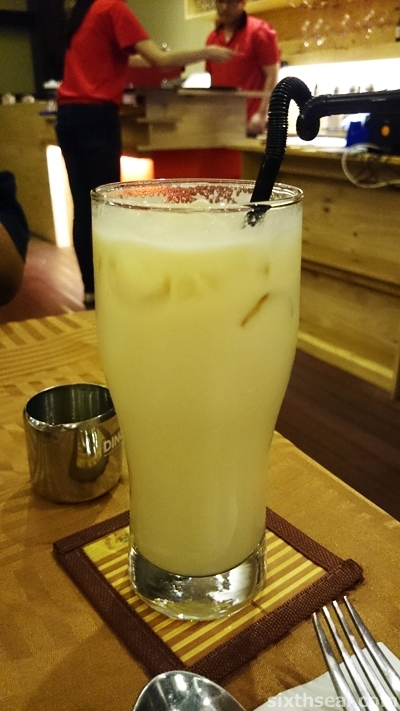 We were at Rebellions Coffee Bar over the weekend to see what it’s like. It’s the first time we’ve all been here, my better half had an appointment with a New Zealand Trade representative (thanks for all the stuff from NZ) and we decided on this place to have coffee. 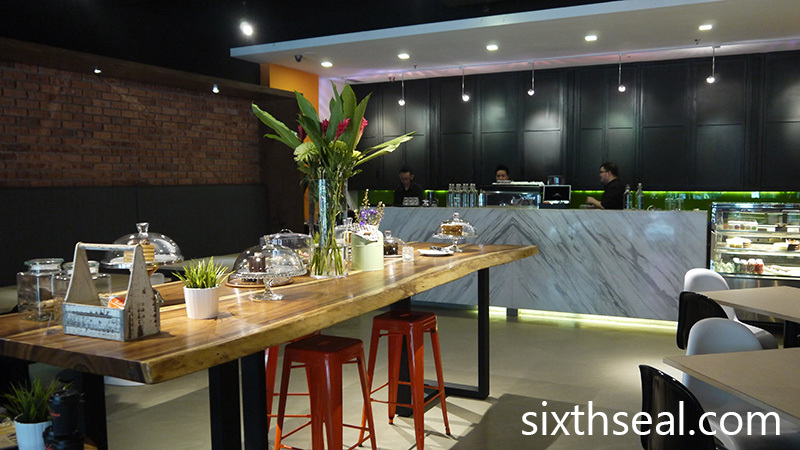 Interestingly, we were told that it looks very similar to a popular café in Auckland in terms in interior décor. 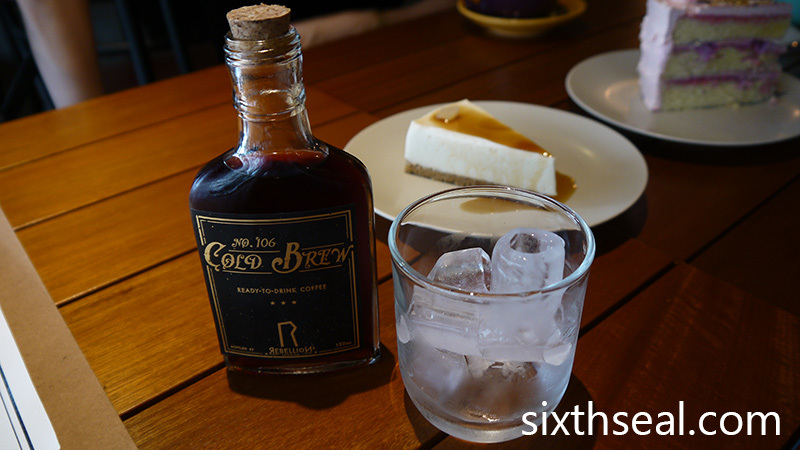 I had the No.106 Cold Brew (RM 13). 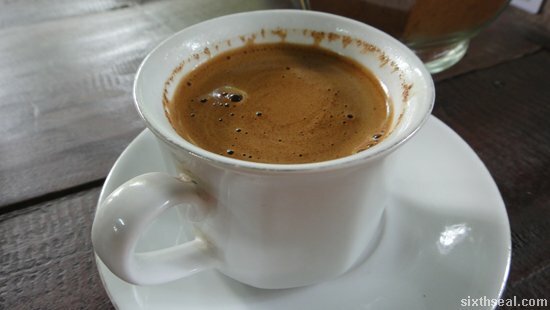 This is the Black version which consists of Finca Santa Teresa beans from Panama. 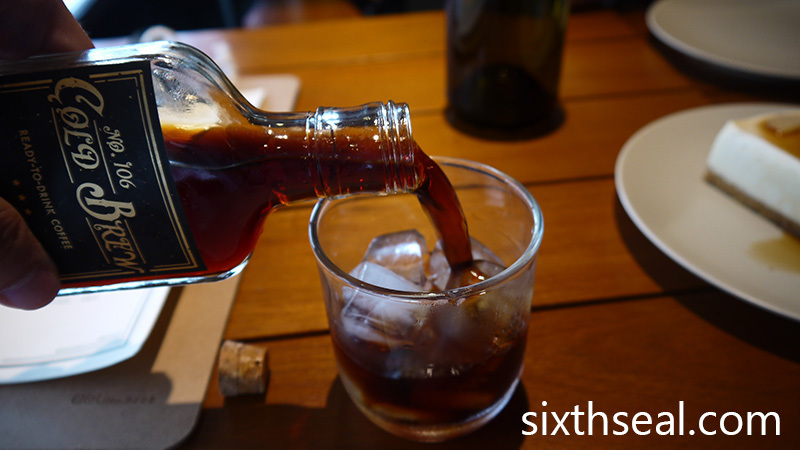 It’s served in a 150 ml bottle (about half a pint) and came under the heading “Filter Coffee”. It came with a cork stopper and is supposed to be poured over ice cubes – this tasted very fruity and lacked the caffeine punch I’m used to. 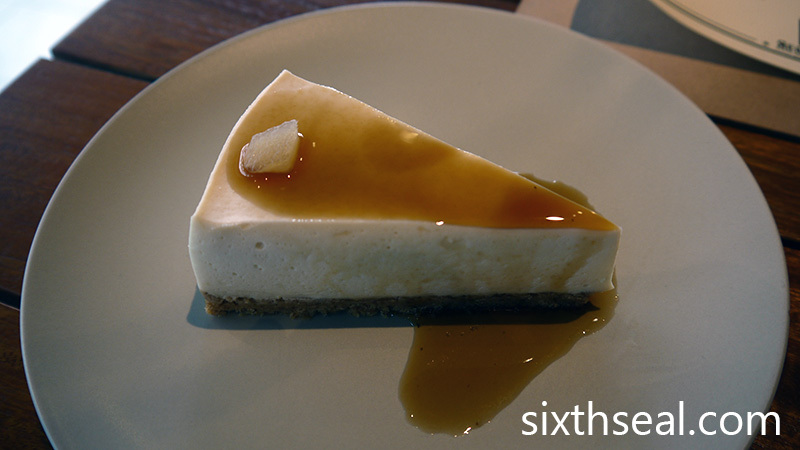 We also had the Taufufa Cheesecake with Gula Melaka Ginger Syrup. I thought this was a really interesting slice of cake! 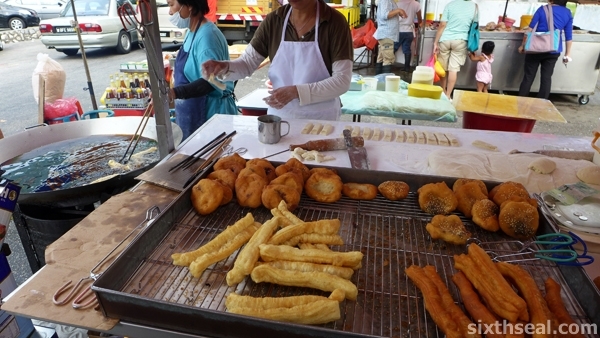 It’s made with tau fu fa (tofu/soybean pudding) as a local twist, further compounded by the use of palm sugar. It’s not as rich as a traditional Philadelphia cheese cake but that’s the point. The lightness is wonderful and I like how the ginger syrup cuts through the richness. 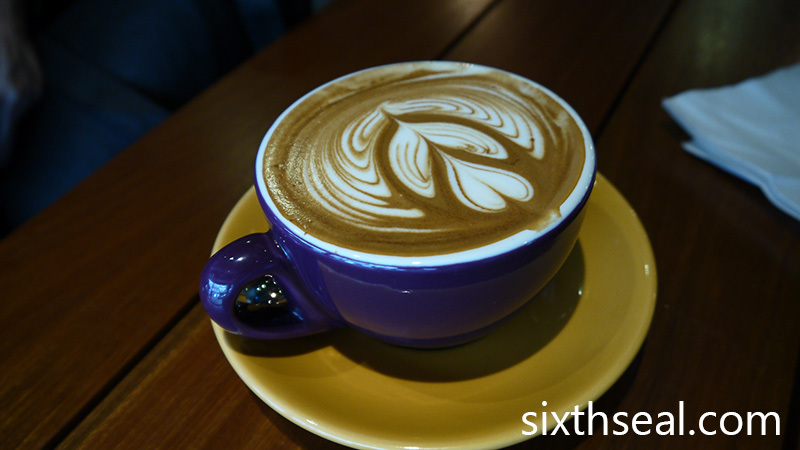 This is the Flat White (RM 11) which the NZT representative had. 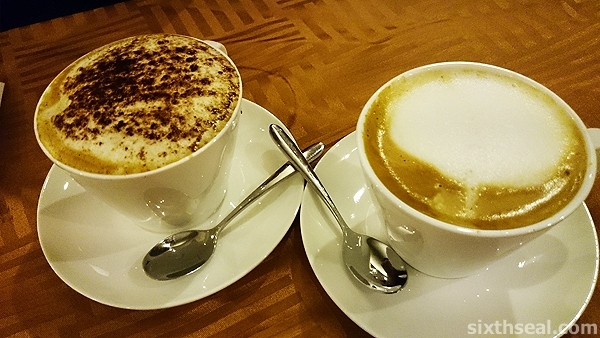 She just came back from New Zealand and it’s noteworthy to point out that flat white originated down under too, first in Australia and then in New Zealand. Rebellions Coffee Bar made it with nice latte art on top. 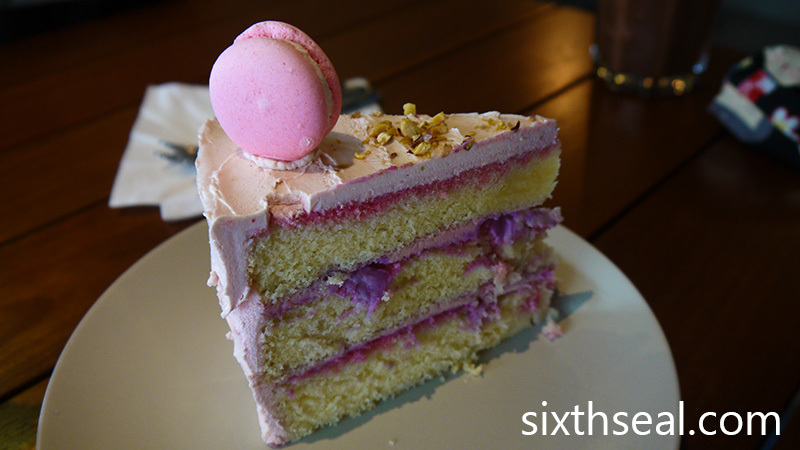 We also had a slice of the Lychee Rose – a decadent three-layered cake with frosting covering each layer. It also had a smattering of toasted pistachio nuts and a lychee rose macaron on each slice. I shared the macaron with my better half and while it wasn’t mind-blowing (we’ve had the best macarons in France and the famous Zumbarons from Australia) the cake as a whole was quite decent. 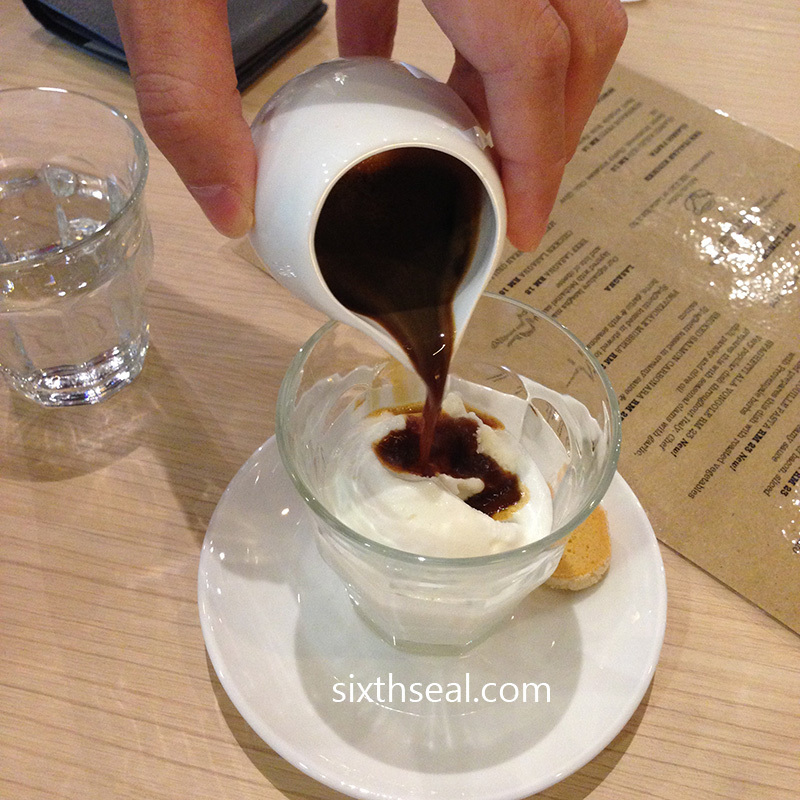 My better half ordered the Nutella Chocolate Bomb (RM 16) which according to the barista is a *calorie bomb*. Haha. Yup, Rebellionz also serve chai, milk and hot chocolate based drinks under “Maybe Something Else”. 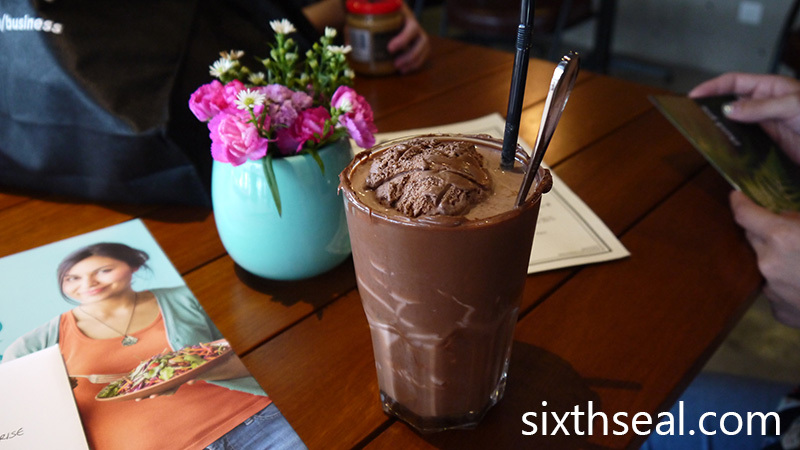 There’s a ball of ice cream inside the drink which tastes like chocolate. It’s not very sweet although it seems like it would be. I like how the lip of the tall glass is smeared with Nutella, much like how the rim of a margarita would be crusted with rock salt – it’s a very nice touch. 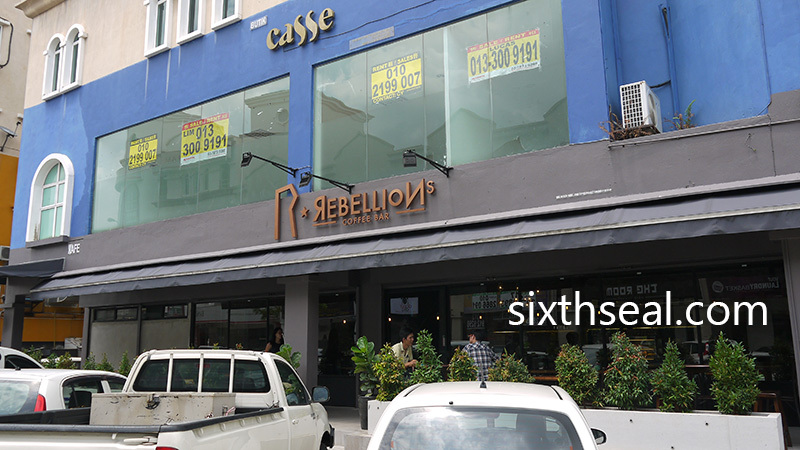 I thought Rebellions Coffee Bar is a nice new addition to the Dataran Sunway area with good coffee and cake. 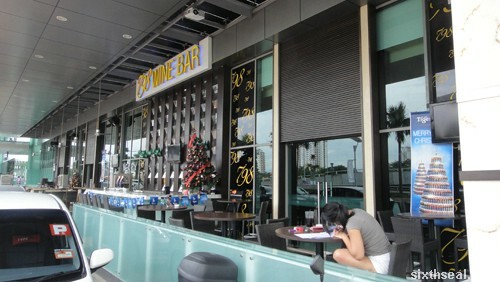 There are a lot of cafes here though and F&B outlets don’t last long – a good example would be Flaming Melt, which closed down months after opening. The traffic is horrible but if you can survive there is a captive market here. We saw this while walking around the mall one day. 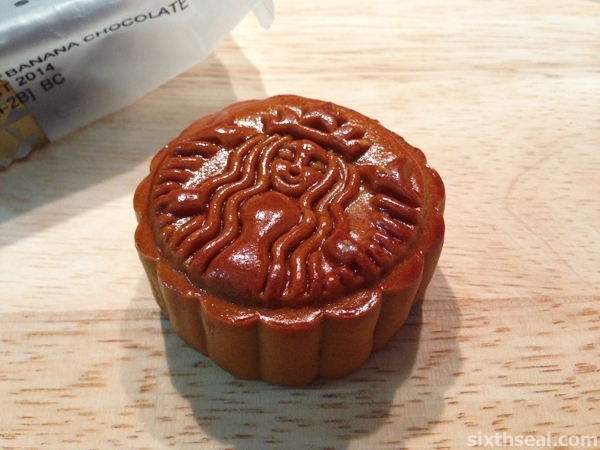 I didn’t realize Starbucks sells mooncakes and the barista told me they’ve been doing so for three (3) years – just not during Mid-Autumn Festival. I laughed at that and asked when they actually sold it, and it turned out to be the Lunar New Year (!!!). 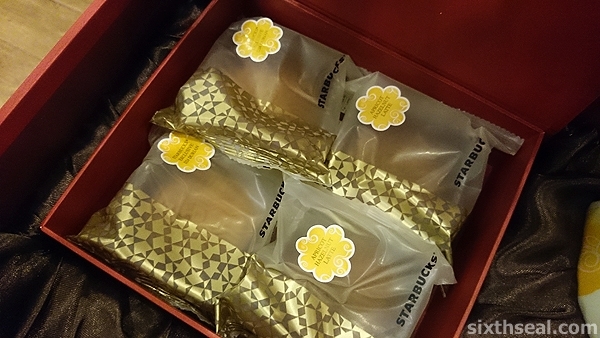 This is the first time they’ve sold mooncakes at the *right time* during Mid-Autumn Festival. 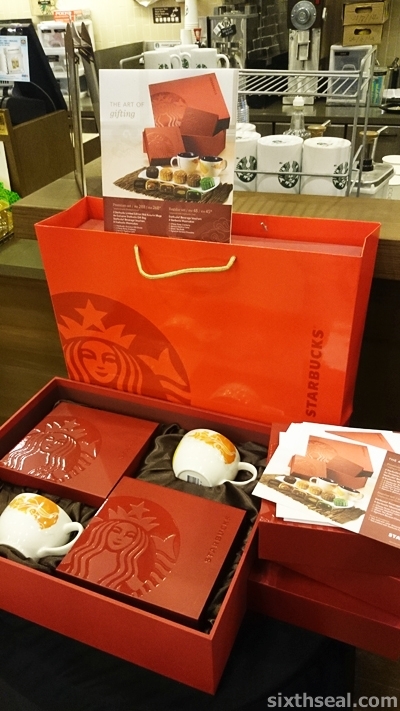 The mooncakes are RM 48++ per box or RM 288++ for 2 boxes in a gift set with a pair of Starbucks mugs. 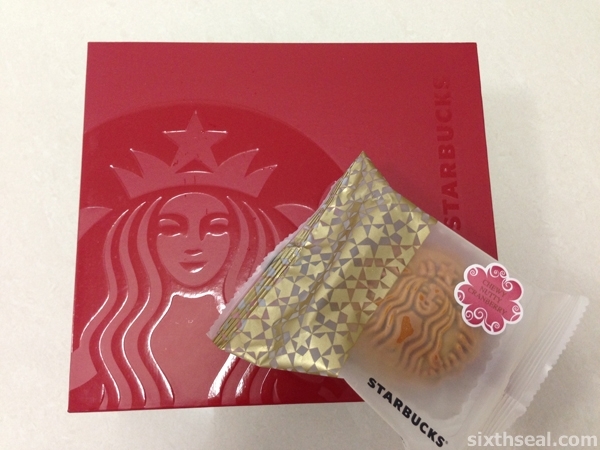 The gift set also has the Starbucks Exclusive D24 Durian Mooncake. My better half bought a box for my dad, which I brought back home to Sibu and I bought a box for my dear so she could try them. 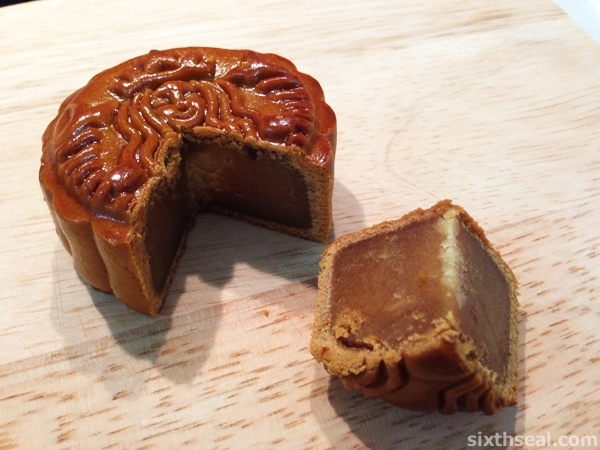 These are not full-sized mooncakes – it’s mini mooncakes! 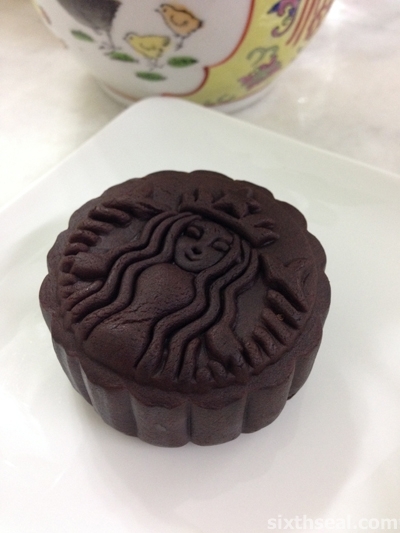 This is a very interesting mooncake – the skin is made of aromatic Starbucks VIA coffee! That’s their brand of ready to brew coffee which retails for RM 28 for 5 packs. I’ve had them before, you just need to add water and it’s an ingeniously stable way to add real coffee into the baked mooncake skin. There’s also hazelnut lotus paste inside with bits of chunky apricot and the faux “egg yolk center” is made of cream cheese soft filling. I love the strong taste of coffee and was wondering where it came from before realizing it’s in the skin! 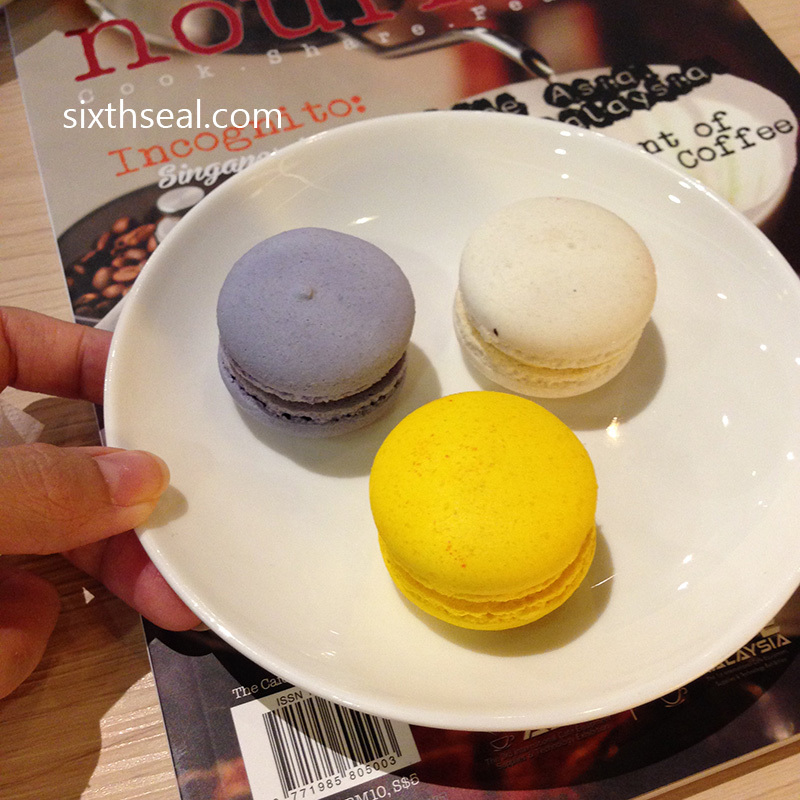 It’s an exciting treat that adds indulgence in every bite – a real winner! This tastes eerily like the fruits with nuts and ham traditional mooncakes! It has a similar texture and if there was a blind taste taste, I might be hard pressed to differentiate the two, if not for the slight tang of cranberry and the absence of lard. 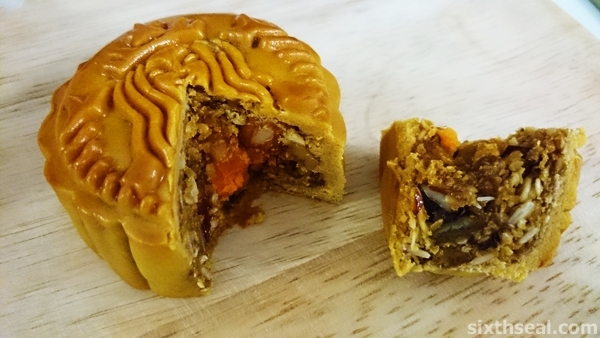 I think it’s meant to be this way – the mooncake is jammed with cranberries, orange peels/zest, a variety of nuts and melon kernel seeds with the savory twist of a salted egg center. It’s rich in taste and texture – a halal version of a classic. 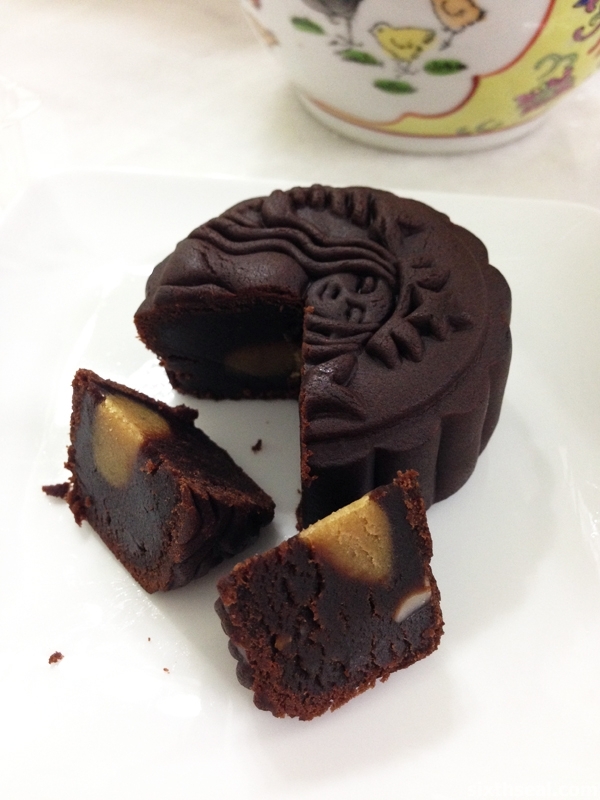 This is their signature mooncake of 2014 and it contains banana in lieu of the traditional salted egg center. It’s quite an interesting flagship offering – the pastry skin is made of chocolate and there’s bits of actual banana in the center. It sounds very simple but the taste and texture works very well together – the creamy chocolate lotus filling, the baked chocolate pastry skin and the addition of real bananas are a treat! This tastes suspiciously (or refreshingly) like the Green Tea Latte drink in their outlets. 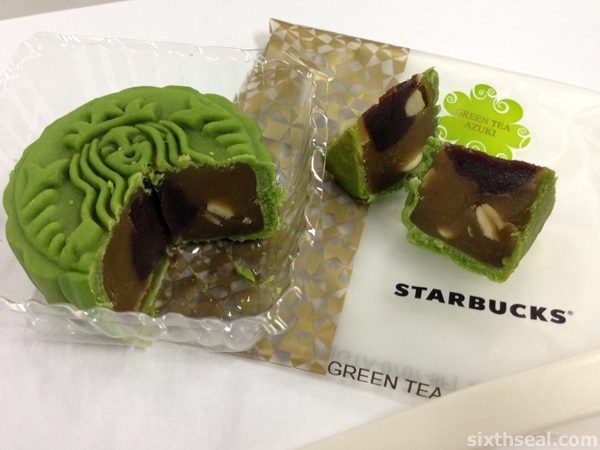 That’s probably coz they used the same premium green tea in the lotus filling. There’s also the classic combination of red bean paste and white kernels in the filling, making it a perfect combination of Japanese inspired flair. I really liked how the matcha is baked into the pastry skin. I’ve been quite annoyed at mooncakes that promises the moon (haha) but doesn’t deliver – mediocre tasteless baked skins with only the fillings as innovation. 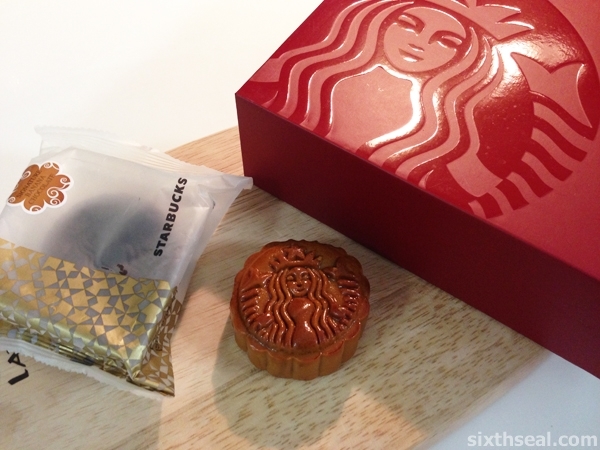 I’m glad Starbucks went the harder route – actually baking flavors into the mooncake pastry. 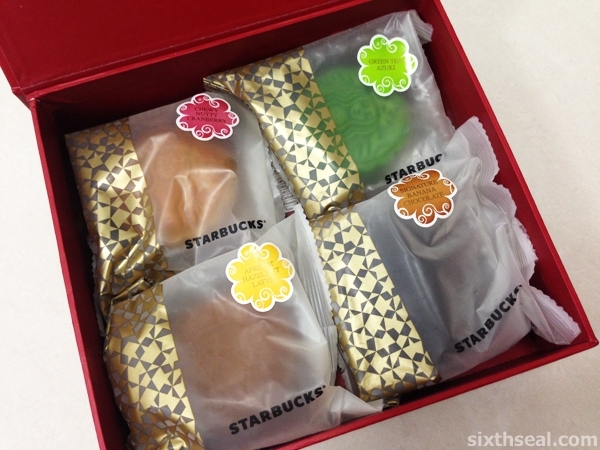 I thought the Starbucks Mid-Autumn Collection 2014 was quite interesting. It’s also very competitively priced (at least at first glance) but they’re actually miniature mooncakes instead of full-sized ones. We also got a couple of vouchers for Starbucks drinks included and each box came up to slightly over RM 50 after taxes and all. 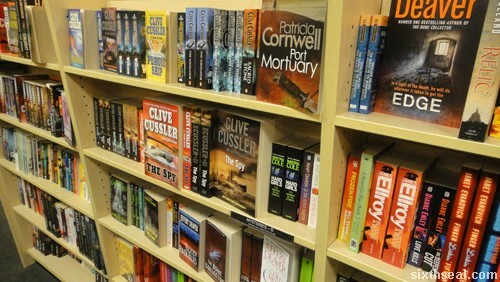 Aussie Story is new – very, very new. It has only been open for 4 days and we went on the fourth day of their operations. No newspaper advertising, no Facebook/Twitter/Instagram page, just pure old school word-of-mouth accompanied their soft launch and it’s been packed every single night ever since they opened their doors! The congratulatory wreaths that celebrated the launch were still fresh! We didn’t know about the place, we chanced upon the restaurant by accident and decided to go in and take a peek at the menu. 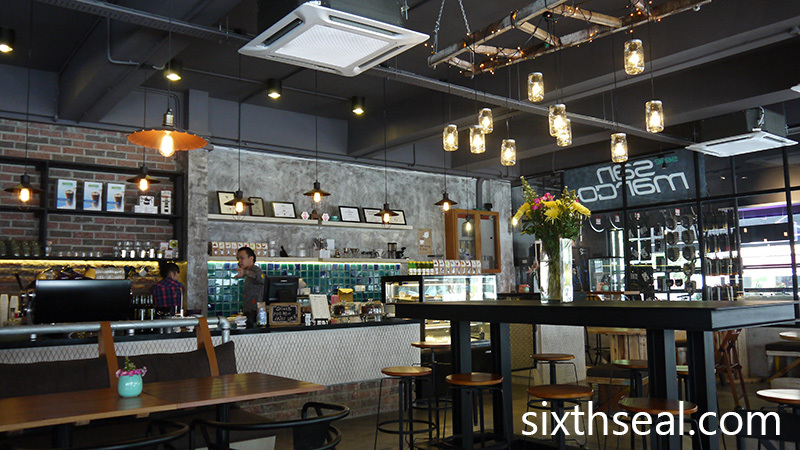 It’s a very nice place – you can say that the warm, soft-incandescent lit interior called out to us on a rainy day. 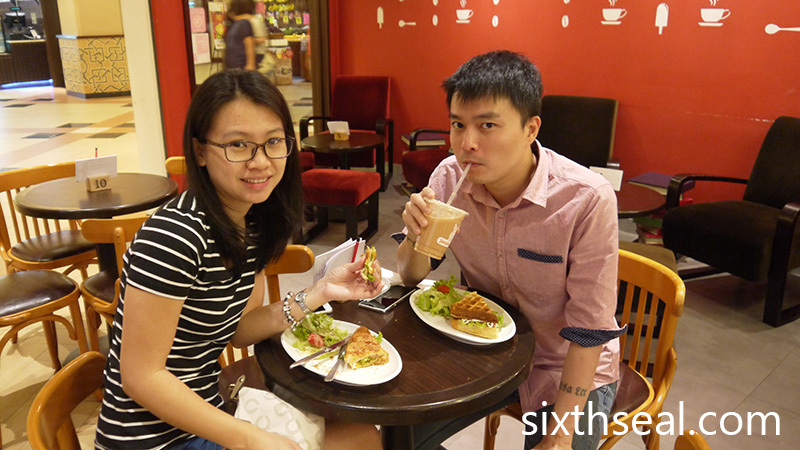 The place is a joint venture between two friends who’ve been classmates since their school days. 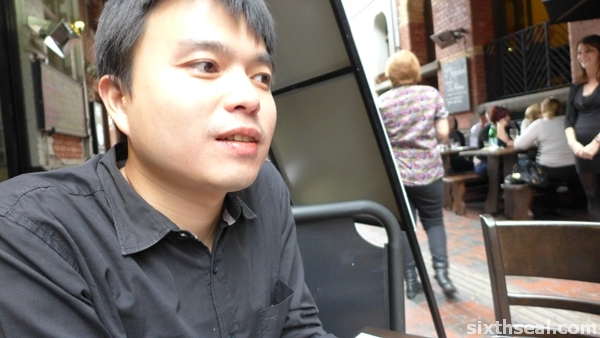 Fredrick Wong is the barista and he’s in charge of the front-of-house while his partner Johnny Yong is the head chef and manages the back-of-house. I think this division of labor suits their personalities well, according to the long conversations we had with the both of them. This is the appetizer that Johnny the chef suggested. He almost insisted on it, so Arthur and I ordered it to see what the fuss is all about. 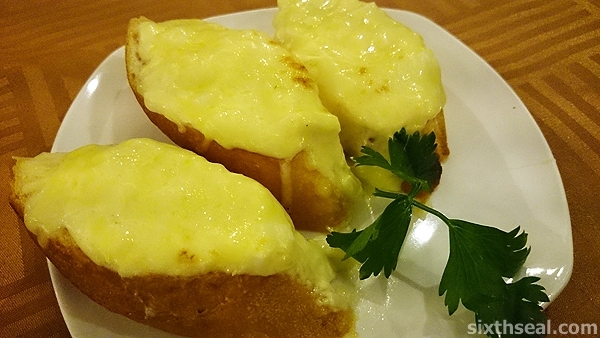 It’s a baguette that’s been sliced and covered with melted cheese, finely chopped cubes of hard-boiled eggs, and an acidic element (the chef hinted it was based on the Thousand Island dressing). However, it came out so fast I could see that only 2 of the 3 pieces had been browned properly. I don’t mind the chewy texture of the bread but I think it could have been on the oven/toaster/grill for a couple of minutes more so the Maillard reaction and caramelization would have been more even. I thought I would dislike this pale looking appetizer but I thought it was delicious! The cheese and mayo works very well together and you can still taste and feel the texture of the tiny cubes of hard boiled eggs in the topping. There’s also a sour note which really made the dish! 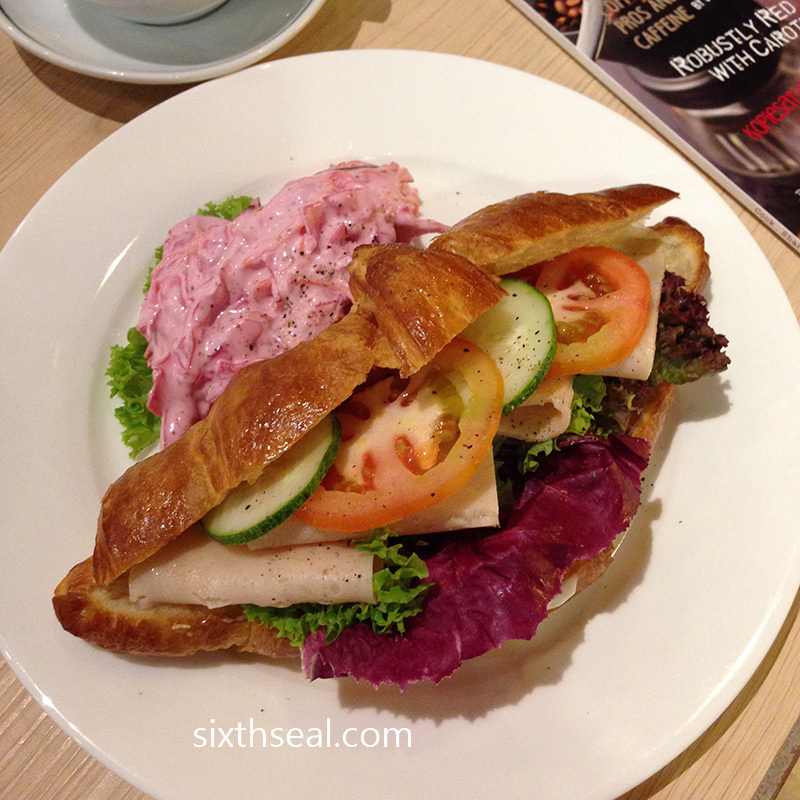 The flavors works very well together and we both enjoyed it very much. I was surprised when this came out almost after the appetizer. It has barely been 5 minutes since we placed our order! 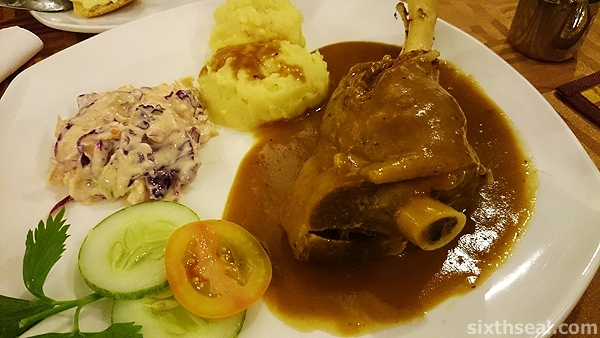 The lamb shank is slightly smaller than the ones that I’m used to seeing but it tasted alright. The meat fell off the bone when picked at with a fork – a sign that it’s been slow-cooked to perfection. I also liked how they left the cartilage on the top of the shank – the best part of ordering the lamb shank, I reckon. The mashed potatoes were good and I really liked their purple cabbage coleslaw. However, one minor quibble I had was about the sauce – it was pretty evident that the gravy that came with the lamb shank isn’t the same reduced gravy that the lamb shank was cooked in – it tasted too watery, as if the gravy was sourced from generic stock and poured over the dish instead of the actual reduction from the lamb shank pot. 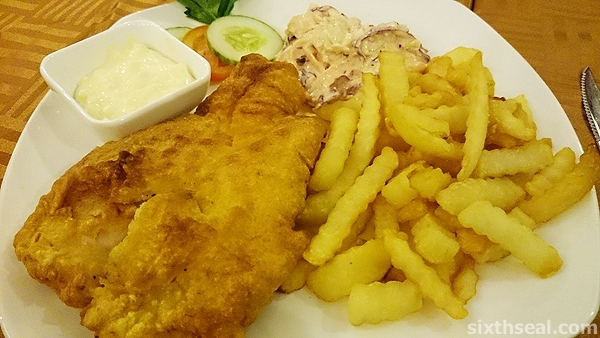 The fish and chips were made with good fish and the batter was seasoned well. 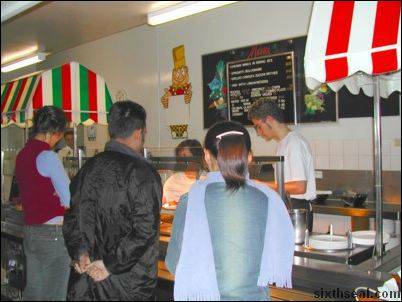 It’s great value for the price too, since you get a huge fillet of fish (which is not the 50% filler, 50% fish abomination that’s been passed off as Dory fillets – they use proper fish fillets here). The dipping sauce keeps up with the times too! 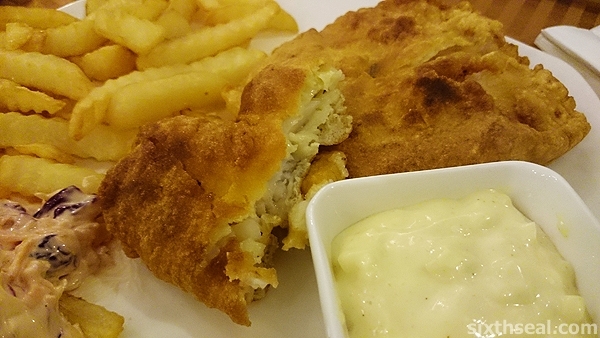 They don’t use tartare sauce (despite what it states on the menu), it’s a pet peeve of mine when F&B outlets do, it’s so 90’s school canteen and it’s usually used to cover the taste of bad fish. Restaurants have found better combinations to go with good catches now and the last time I remember having tartare sauce was during my high school in Christchurch, NZ when the school canteen would serve fish sandwiches slathered with tartare sauce. I’m sure I’ve had tartare sauce in bad local fish and chip outlets since but if I had, it wasn’t memorable enough to remember. 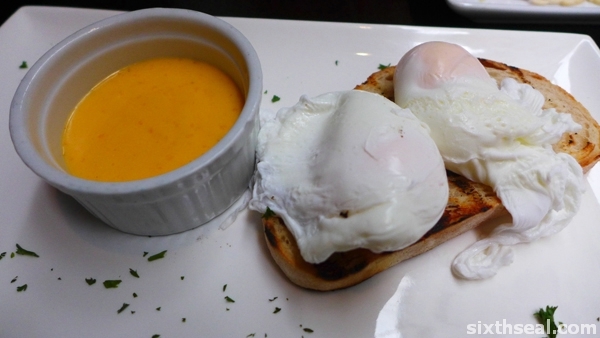 Aussie Story uses a mayo based egg infused dip which I thought was very nice. It reminded me slightly of the dill aioli I had in CREST Café, Birubi Beach recently. I think it’s actually the *same sauce* that goes on top of the baguette appetizer, but without the acidic component. 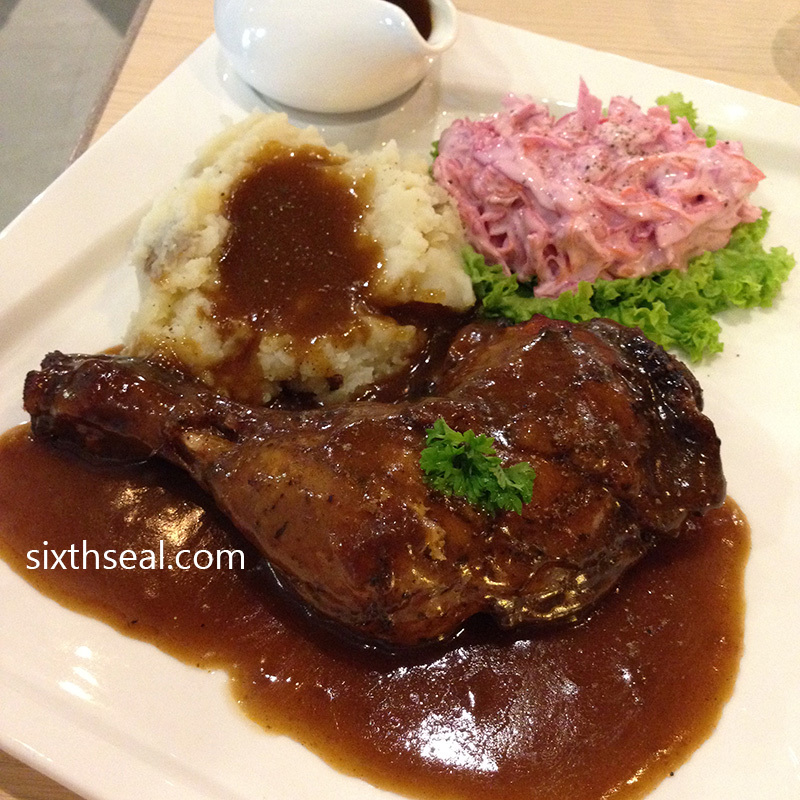 The purple cabbage coleslaw is also the same as the one served in the lamb shank. Overall, I quite liked the dish. I think it’s smart of them to incorporate similar and reusable things across dishes to minimize prep time. Fredrick and Johnny recounted the first day they opened and the trials of having to serve a full house, and having to comp a lot of tables since they couldn’t keep up with the pace of service. One minor feedback that I have is that the appetizers and the main courses all came out at the same time – there’s no time for us to savor the appetizers and then wait for the main courses to arrive. Everything just came out almost immediately, it was so fast it made me slightly dubious on how they can cook everything to order. Fredrick did address this when I raised my concerns though – it seems that Sibu people like having all their dishes on the table at the same time so they can share it. There’s no concept of waiting for a 3-course dinner here and I have to agree with him. 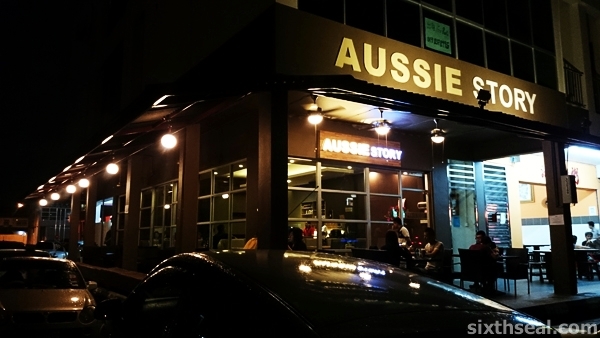 It’s not Aussie Story’s fault, it’s the culture here and they have to accommodate for it lest people complain about their food not arriving promptly. 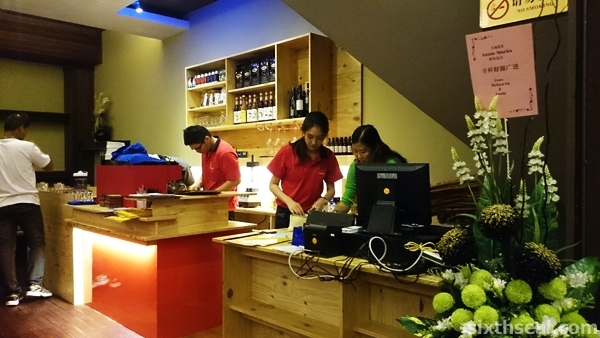 The service is impeccable and they really want to learn – we were solicited on our views of every dish. 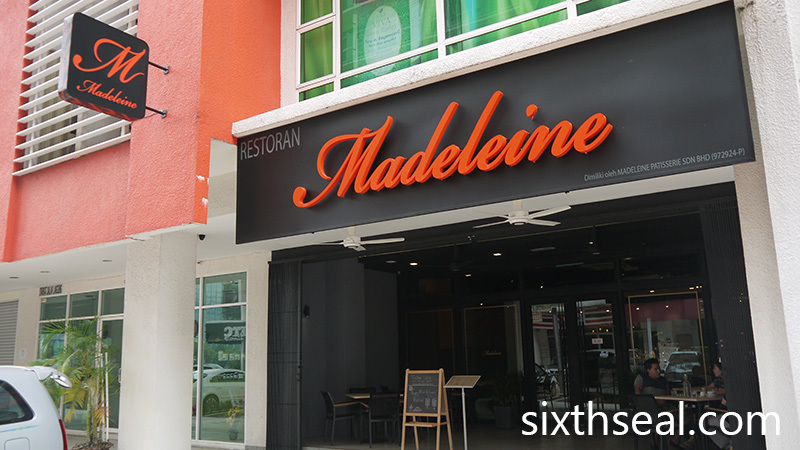 I told the owners that I was very impressed that the head chef and the front-of-house manager would take the time to go to every table and talk to the patrons about the food. 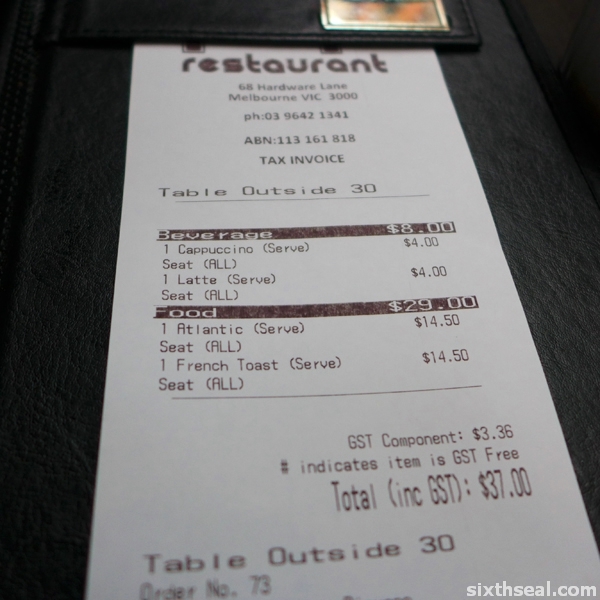 We got all our drinks comped by Fredrick so the bill only came out to a discounted RM 60 for the food. I would highly recommend this place due to the service – their PR is second to none and their food is pretty good overall. It’s up there with places like Tom’s Too but the service here is spectacular. It’s their passion after all, and I went back Saturday night with my dad to try and get a table, but the place was totally full. 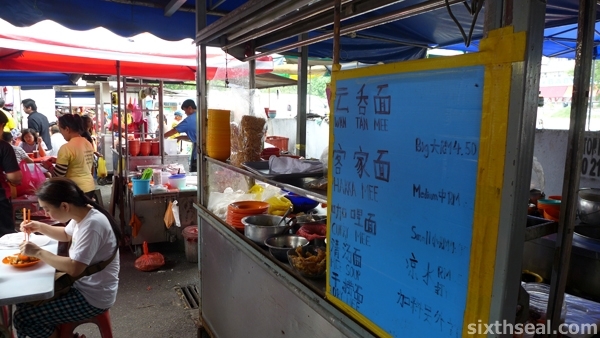 The SS2 wet market is located at an intersecting lane and you’ll see a fair amount of vendors selling all sorts of stuff from chicken to vegetables (and everything in between). 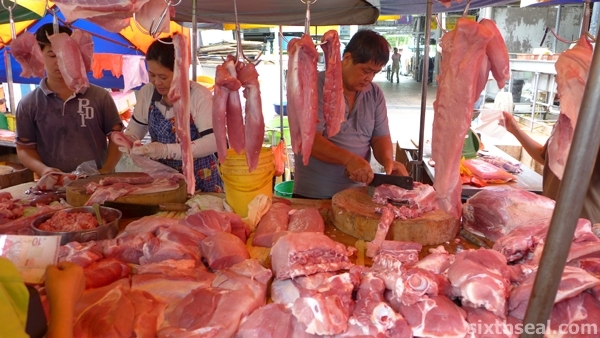 Pork butchers, fish mongers, they have it all! 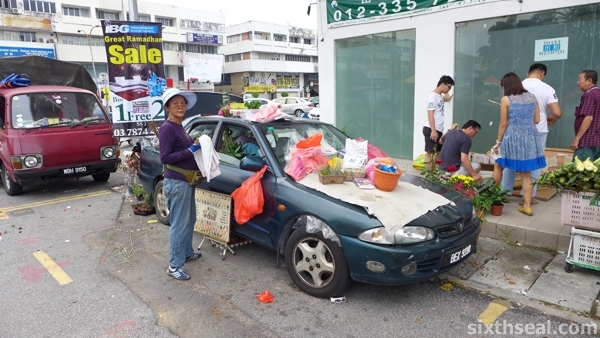 There’s even a car that’s filled with flowers – for sale! 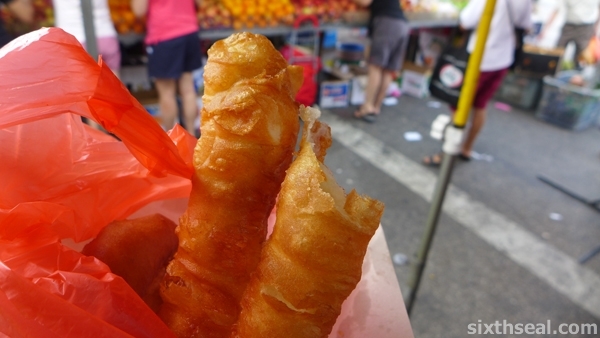 We got some piping hot yu tiaw (fried dough) to munch on while doing our weekly grocery shopping at the equivalent of the local market (instead of the supermarkets we usually go to). 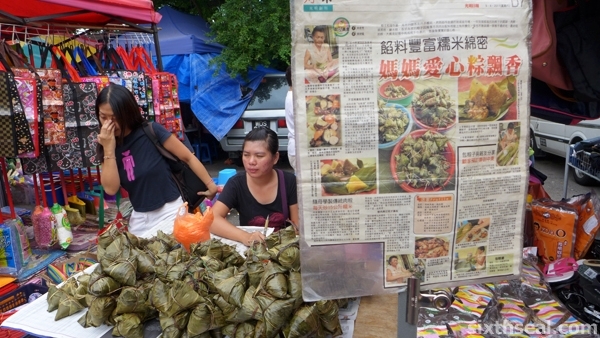 I also got two bak chang (glutinous rice dumplings) – the Dried Oyster Rice Dumpling has dried oysters, mushrooms, pork, salted egg, dried shrimp and chestnuts for RM 5.50 while the Salted Egg Rice Dumpling has all the above except for the dried oysters and with the addition of lintel / green bean for RM 4.50. My dear also bought this huge take away bag of soy milk for just RM 1. There’s about 1 liter of soy bean milk inside and the queue for this is insane – not because it’s good (it’s rather diluted) but coz you get a lot of bang for your buck. 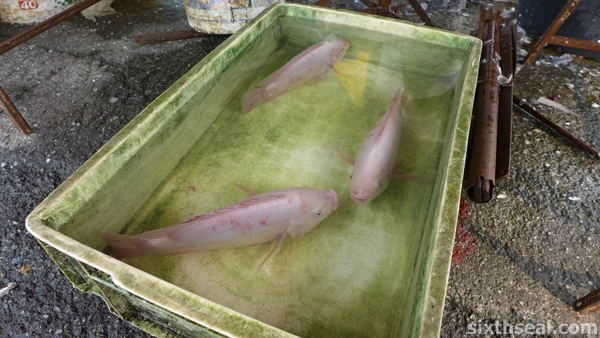 We also looked at the fresh fish stalls – some of them had specimens that are still alive and kickin’ (or rather, swimming). 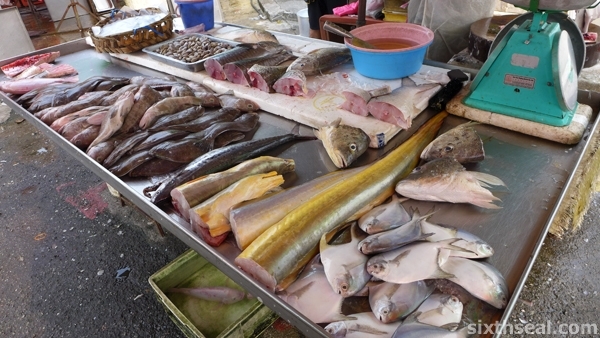 I was interested in this huge eel that we later found out was called yellow conger eel. It’s RM 8 / kg. I bought two generously long slices for RM 9. We later cooked them three (3) ways and it was really good! I didn’t know it was an eel at first, I thought it was a fish. Ling insisted it was an eel and I still thought it was a fish so we Googled it and discovered my better half was *right* – it’s a seasonal eel! 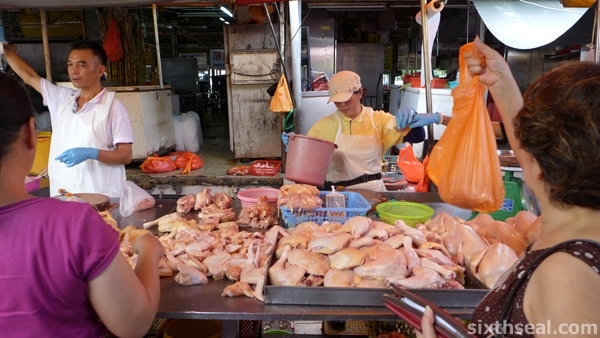 We also bought two chicken legs for RM 16.50 which I thought was a total rip off! 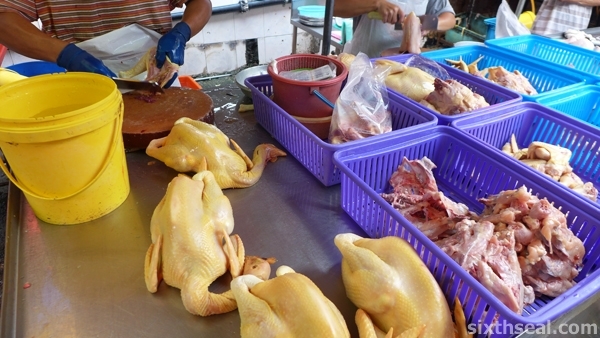 It’s kampung chicken (free range chicken) and I was appalled that just one (1) chicken leg costs RM 8+. My dear told me the price range is about right. I’m used to supermarket chicken prices (the ones reared in stacked cages PETA types are always honking on about). Hot damn, that’s expensive! 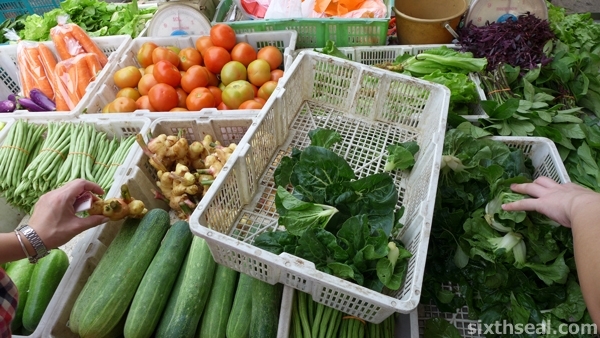 I also found a vegetable which I thought was rather interesting so I got that and lotus root, which we haven’t cooked before. It made for a nice meal with the eel done 3 ways. We also bought some pork ribs (to be cooked tonight!) 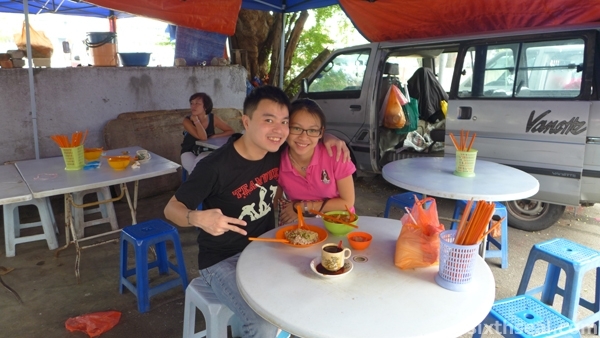 before we headed to one of the food stalls located right inside SS2 wet market. 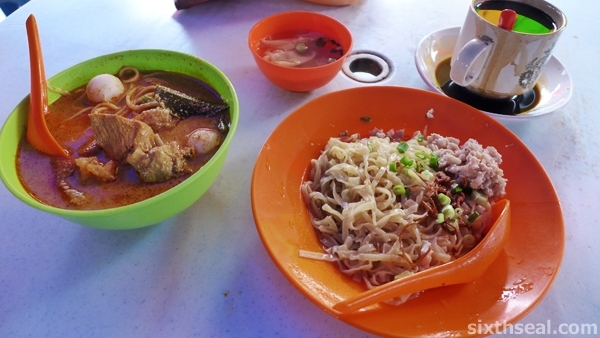 I had the Hakka Mee (RM 4) while she had the Curry Mee (RM 4). Mine had a bucket-load of MSG, which made it taste really nice. 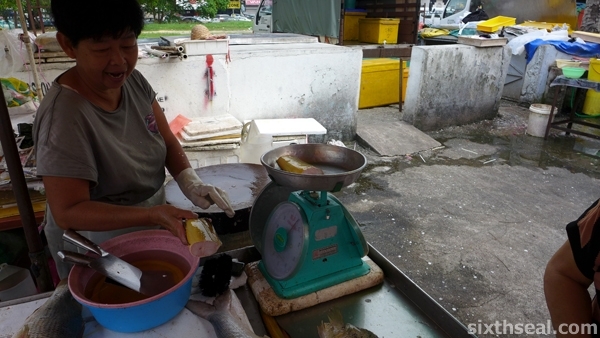 The owner/cook manning the stall is one grumpy lady though. I could tell she was slightly irritated when I ordered but for some reason or other, she didn’t take the piss out of me. The woman who ordered after me was half of a middle-aged couple that just finished jogging and the owner raised her voice and was so rude to her that I wondered why they didn’t just walk away. We didn’t get the nasty treatment so I was thinking that this must be real good food for the other couple to take the abuse. The food wasn’t anything to write home about but it’s decent and cheap. It’s the coffee that really takes home the cake though – home brewed old style with muslin cloth sieves blackened after ages of filtering the coffee grounds and with a sheen of grease (from the frying of the coffee beans with butter, lard, margarine or ghee). It’s a perfect cuppa hot strong brewed coffee that kick started an awesome day of fun in the kitchen and quality time spent together during the long weekend. 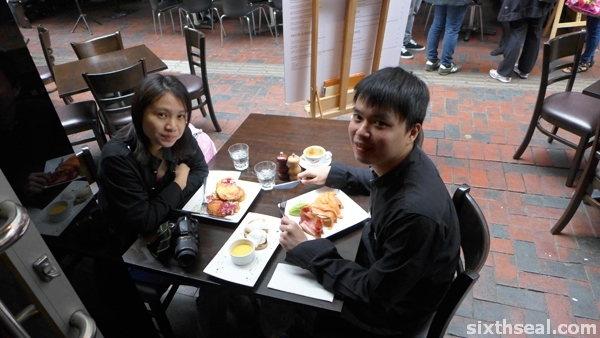 Breakfast at Hardware Lane is one of the greatest Melbourne institutions. Hardware Lane is filled with tiny little sidewalk cafes that crowds into each other, every one vying for your attention and crammed with people eating and drinking coffee. 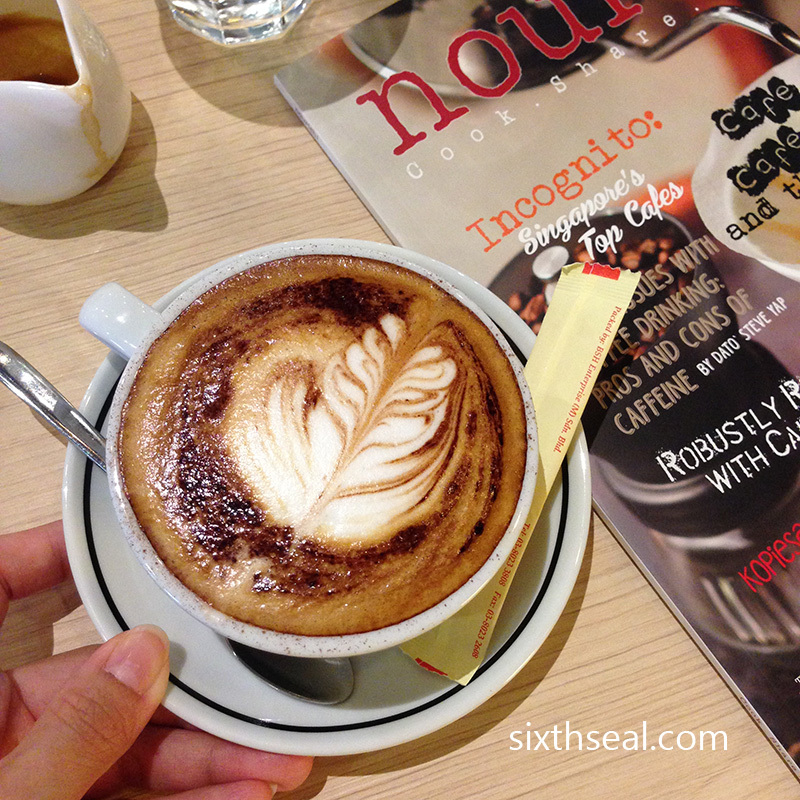 It’s more of the coffee culture and the breakfast (they also serve lunch, of course) that I go for. 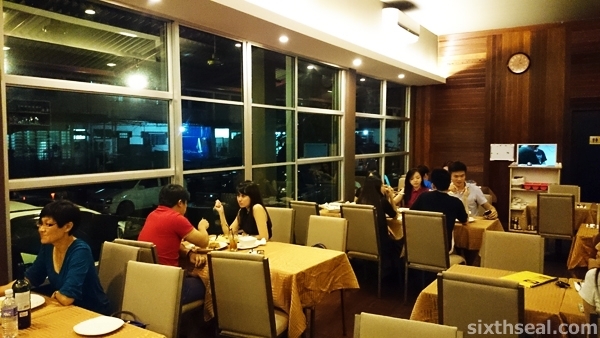 POP Restaurant is one of the most well known nowadays, offering modern Australian cuisine. 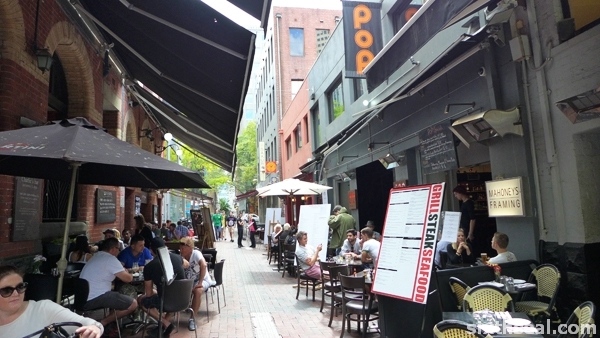 Part of the ambiance of Hardware Lane is the people stuffed into small tables and chairs on both sides of the narrow lane. 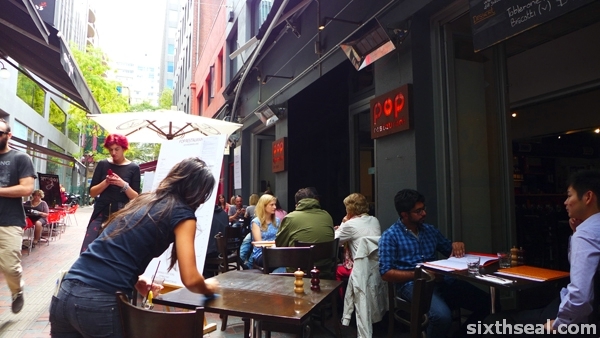 POP Restaurant has their POP Breakfast from 9 am – 3 pm on weekends. 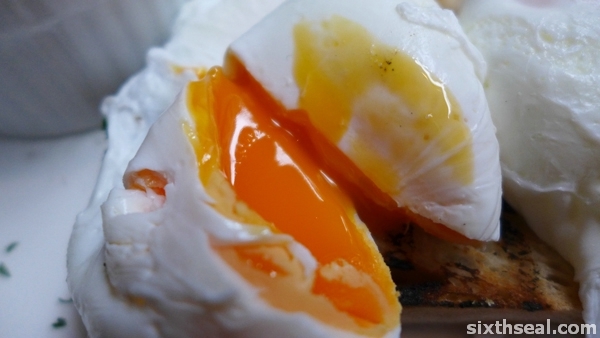 It’s basically an all-day breakfast or close enough to make no difference. 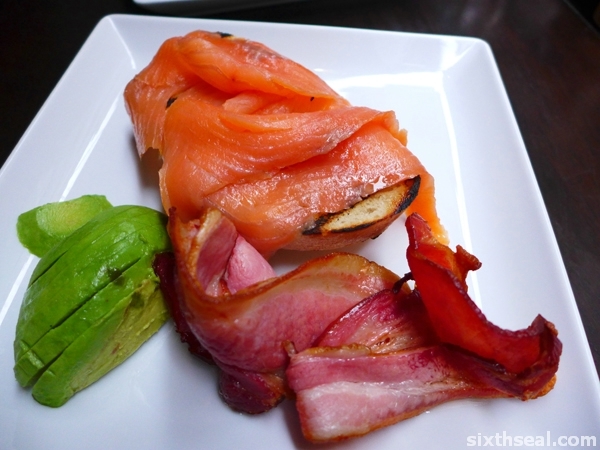 There are various sides on offer – bacon, hash brown, sausage, mushroom, spinach, baked beans, ham, avocado, grilled tomato, salmon, prosciutto, parmesan and hollandaise sauce. 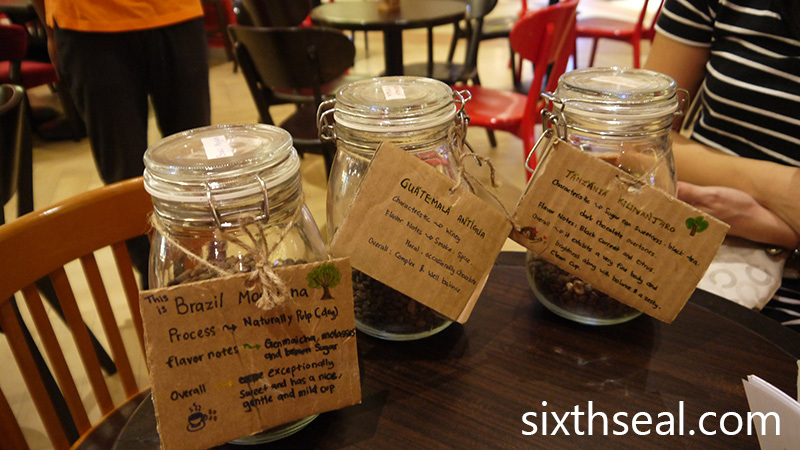 You can add one for AUD 3 for choose a package of 2 or 3 sides for AUD 5.50 and AUD 7.50 respectively. This is what she ordered from the Sweet Tooth menu. 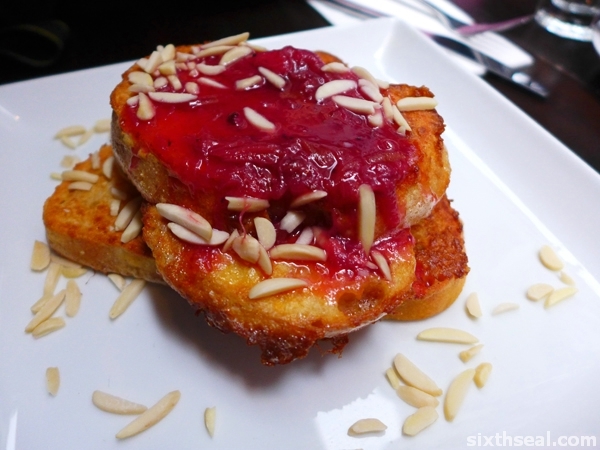 I thought it was pretty good – I like the rhubarb jam on top of the nicely done French Toast and the sprinkling of almonds but she thought it was the worst French Toast she ever had. My bad, dear. I gave her some of my breakfast instead. It showered slightly (as weather in Melbourne tend to do) in the middle of our breakfast so we shifted slightly inside so the patio covers the worst of the rain. 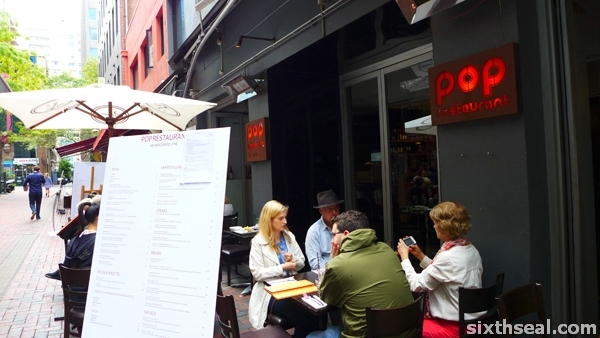 I like the service at POP Restaurant, I’ve always had positive experiences at Hardware Lane in Melbourne. Granted, I only go for breakfast, but that’s the most important meal. ;) The waitress apologized for messing up my order when I asked for the bill (they forgot the ham) and told me the other two sides I ordered are on the house. I thought that was a really nice gesture. I ended up tipping her just about the same amount so the karma balances out. 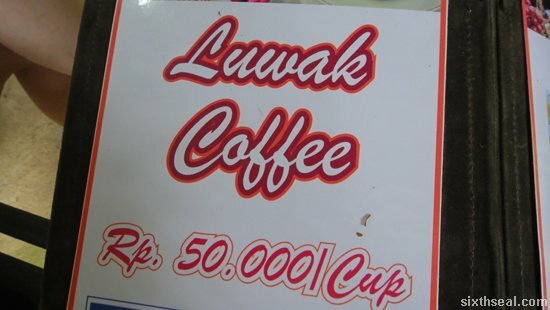 Kopi Luwak or Luwak Coffee is the infamously extravagant coffee that comes out of a civet. Well, you know what I mean. 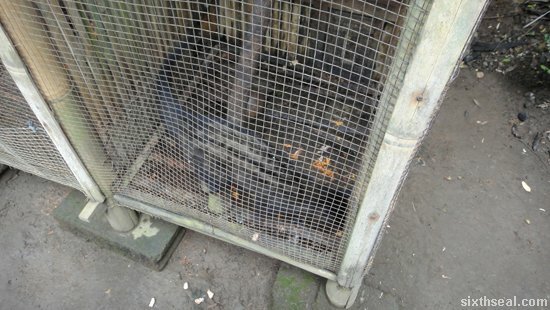 Civet cats like this one eats the coffee beans, supposedly these felines have a taste so refined that they’ll only go for the good ones. 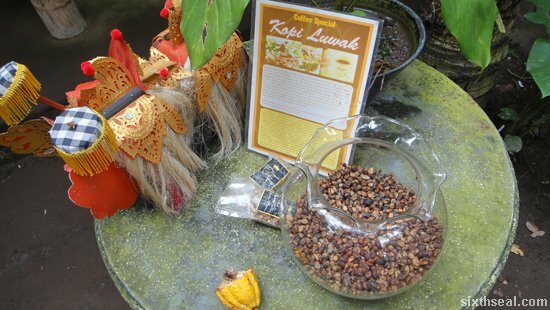 They’ll crap it out and people dig the coffee beans (which isn’t digested by the civet cat) from the dung and roast it. It’s surprisingly aromatic and very smooth coffee. I liked it, although we paid quite a bit for that small cup. How much? That’s about RM 20. We went to this place quite far from the touristy areas too, we saw it go for IDR 150,000 (RM 50) in airports. Yes, that’s the price for just one cup. I used to massacre the system when I was in university. I lived on campus and we’re allowed one drink per meal purchased. 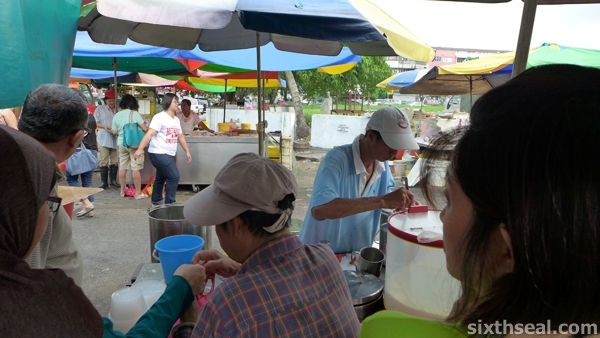 However, the drink station is unregulated – it’s based on the trust system. 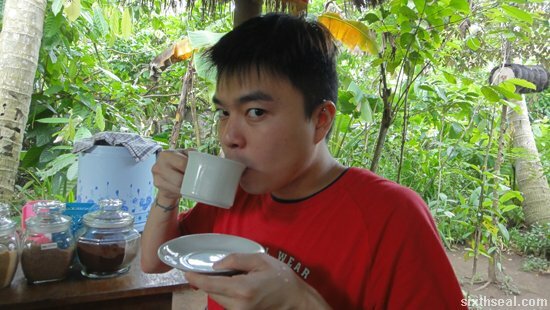 My usual beverage back then probably had enough caffeine to kill a small elephant. The coffee dispenser deals out one teaspoon of instant coffee per turn and I would turn the knob 10-14 times into a small Styrofoam cup and fill it with hot milk. This evil beverage is drunk in one shot and is enough to keep me awake and wired for the entire night. I pretty much continued this after I graduated and joined the rat race, except at a much lower dose. 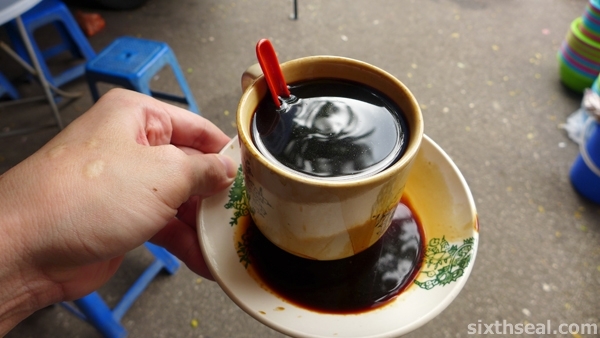 I would drink 2 sachets of instant coffee first thing when I wake up in the morning, just to jolt myself awake. The sound of people trudging into the office in the morning is often followed by the long trek to the hot water dispenser with a packet of 3-in-1 instant coffee in hand. It is the cornerstone of the workforce – men and women just can’t function before their morning cup of Joe. 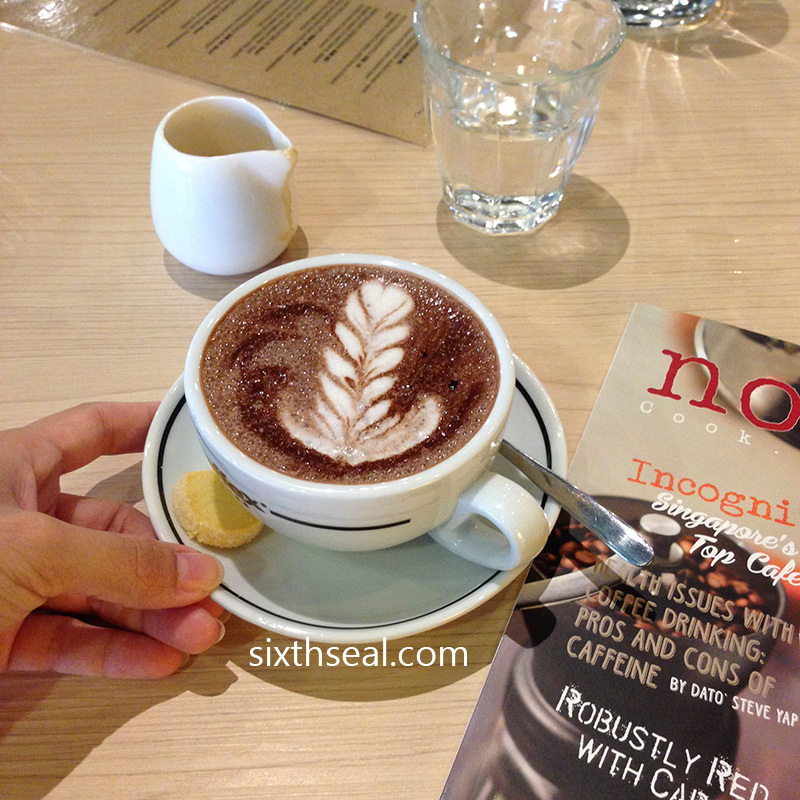 I have sampled pretty much most of the brands of instant coffee out there. I can’t say I have favorites per se, I usually pick up what I haven’t tried or is on offer. 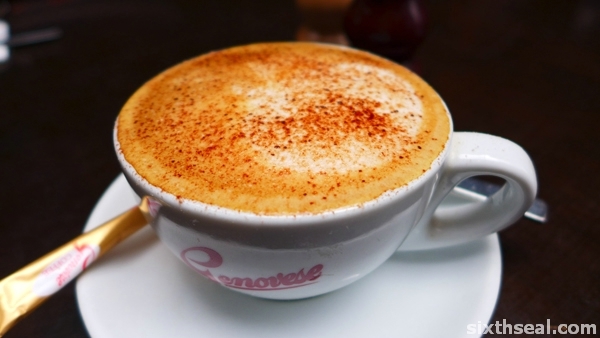 To me, coffee is just a vessel for delivering caffeine. Anyway, I was walking the aisles of the local hypermarket doing my weekend shopping when I noticed a promotion with Super. They’re having a offer where you get a free JJ Lin notebook with every purchase of two packets of Super 3in1 Regular coffee. 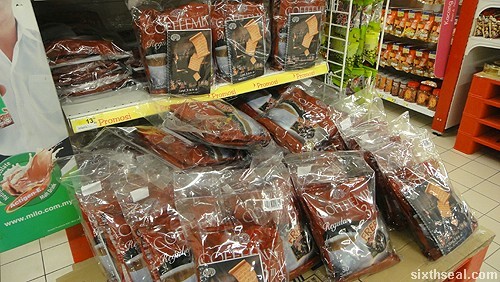 Each packet has 30 sachets of coffee each and at RM 13.99, that comes out to be a pretty good bargain. 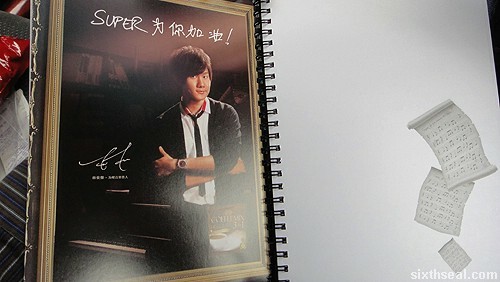 JJ Lin is the brand ambassador for Super’s Coffee and the notebook has a nice embossed cover with a matte finish. 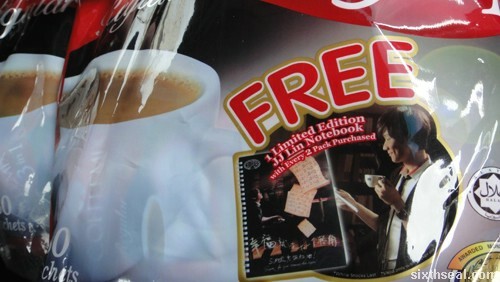 The inside of the notebook contains the storyline of Super Coffeemix’s TVC which aired earlier this year. It’s perfect as a gift for JJ Lin fans or to keep for yourself to jot down notes.